Ian C. Esslemont’s “Night of Knives” is my first encounter with the Malazan Empire. I only acquired the novels of Steven Erikson this year, so my first step in the Malazan world was made through this novel. The city of Malaz, set on the island with the same name and which gives the Empire its name, is preparing for an event that occurs once in a generation, The Shadow Moon. In this evening a Convergence happens and boundaries can be crossed between realms. Also it is said that tonight the Emperor Kellanved will return to reclaim his throne. 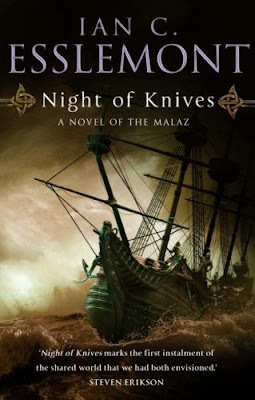 The events described by Ian C. Esslemont in his debut novel “Night of Knives” are related to the novels in the series Malazan Book of the Fallen written by Steven Erikson. But this doesn’t come as a surprise because the two authors worked together on building the Malazan world. For the newcomers some events related on this novel may be unknown and unfamiliar, but this fact will not be a barrier in enjoying this book. The novel is pretty much a standalone and I liked it as it is, even though I stepped over the events that were unfamiliar to me. The story is told from the perspective of two main characters, Temper, a veteran soldier and Kiska, a young girl who is trying to be remarked and to get away from the island. I found both characters enjoyable and well built, but my personal favorite is Temper. I liked how the author worked with this one and I liked him since his first appearance in the novel. What drew me closer to this character is the fact that he has his weaknesses and his bad habits. I also really enjoyed the recollections of his past, when Temper remembers his fighting days. I liked the entire atmosphere of the novel, dark and mysterious. The author makes a good job in building this atmosphere and helps the reader to step into the middle of this strange and dark night. Contributing to this dark atmosphere are the events of the novel, too. And all the events are condensed, because are concentrated only in one night. Therefore the novel benefits from a lot of action and although sometimes the pace decreases a little my general impression is good. The description of Malaz City, the glimpses on the Malazan world history and Temper’s recollections of his battles were among my favorite parts of the novel. But above all what Ian C. Esslemont did with “Night of Knives” for me was to incite my appetite for the entire Malazan world and the novels of this series. Even though I enjoyed this novel as a standalone I believe that it will work its best after reading Steven Erikson’s novels. I would recommend this because I believe that when reading “Night of Knives” stumbling upon familiar places and events of Erikson’s series will add to the pleasure of this reading. As I said Ian C. Esslemont’s novel, “Night of Knives”, stirred up my interest for Malazan world, but I will re-read the novel after I will travel once through “Malazan Book of the Fallen” series. I think it could go either way. If you read this first it gives you a head start on some of the background you have to work to pick up in the other novels. It might be nice to have read it before Toll The Hounds so you have some more background on Dassem.